In this Growers Spotlight, we interview three specialists about compost teas used in commercial cannabis: Jason Stirling, lead grower for SPARC Dispensaries, Steve Storch, inventor of the Vortex Brewer®, and Scott McBride, owner of Global Garden Supply LLC, manufacturer and seller of Vortex Brewers®. Compost teas are a part of the organic growing movement in the cannabis and food industries. Jason, Steve, and Scott discuss the equipment, philosophy, and processes they employ with compost teas to achieve the goal of growing organically. The following was an interview with industry experts. Growers Network does not endorse nor evaluate the claims of our interviewees, nor do they influence our editorial process. We thank our interviewees for their time and effort so we can continue our exclusive Growers Spotlight service. 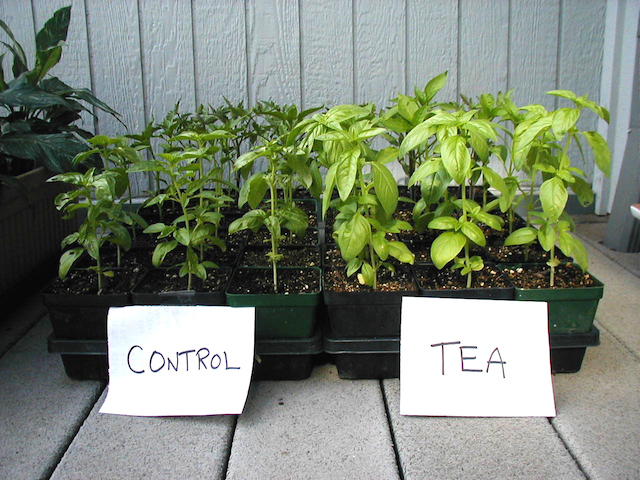 Compost teas, often shortened to just “tea,” are part of a new approach to plant nutrition and soil inoculation, where, rather than letting the microbial community develop by chance, growers deliberately inject preferred microbes and nutrients into their grow medium. As the name suggests, compost teas start with compost, which is an excellent source of nutrition for plants. However, the nutrition in compost is typically locked away inside large, complex organic molecules. Microbes inside compost break down the complex molecules into simpler molecules that plants can easily absorb. 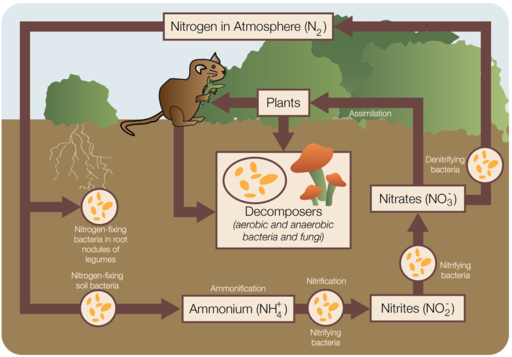 A simple diagram demonstrating the relationship of soil bacteria with the environment. Compost teas take plant nutrition a step further by nurturing microbial growth, improving the effectiveness of traditional compost. When compost teas are “brewed,” microbes are cultured in warm water with plenty of air: ideal conditions for growth and propagation. These microbes form symbioses with the plants, making them more vigorous, healthy, and resilient to stress, resulting in bigger, better yields. Why can’t we just take some compost or manure, throw it in some warm water, and call it a tea? We don’t, because doing so would not create the ideal conditions for beneficial bacteria to grow. Beneficial aerobic soil microbes require a constant supply of air to grow and reproduce. Without a consistent means of agitating and aerating the water, harmful anaerobic bacteria and parasites would grow instead. A comparison of basil grown in normal soil to grown with compost tea. This is the reasoning behind “AACT” teas, or Actively Aerated Compost Teas, that are brewed by machines like the Vortex Brewer®. These teas take the benefits of compost one step further by facilitating the growth of beneficial bacteria which can improve plant health through a series of complex symbiotic interactions with plant roots. These microbes persist in the root area of the plant, or “rhizosphere”, and provide nutrition and health benefits to the plant for the lifetime of the microbes. 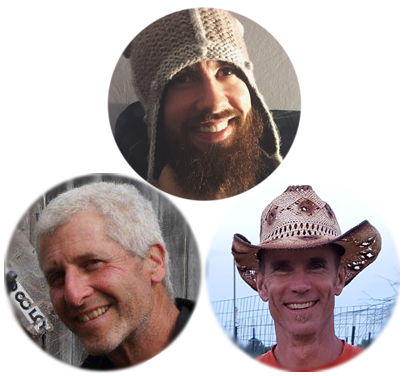 Jason, Scott, and Steve subscribe to biodynamic agriculture, an early form of alternative, organic agriculture. It emphasizes the use of manure and compost to the exclusion of artificial chemical fertilizers on plants. In biodynamic agriculture, livestock, crops, and soil are part of a larger, interconnected system. For this reason, biodynamic agriculture is often compared to integrated farming, with the addition of several controversial elements, such as the use of cow horns and deer bladders in preparations. A number of studies have been conducted comparing biodynamic practices and conventional organic practices, but the results are inconclusive. Some studies found no major differences between the two practices, while others found that biodynamic methods improved soil health and productive efficiency. A study comparing several farms using conventional compost and biodynamically prepared compost. After 2 months, there were no observable differences between the farms. However, after 3 months, there was some evidence that biodynamic compost improved soil quality. A study comparing conventional compost preparations and biodynamically-prepared compost. This study found no observable differences among the different methods. A meta review of different studies on biodynamic farming. It found inconclusive results between conventional compost and biodynamically-prepared compost. Jason started growing as a hobbyist and later moved to Colorado, where he began work as an independent trimmer and harvester. Eventually, his independent work led to several administrative positions, and from there, it was a small leap to become a lead grower. He became a grower for Garden of the Gods, and stayed there until it was bought out. 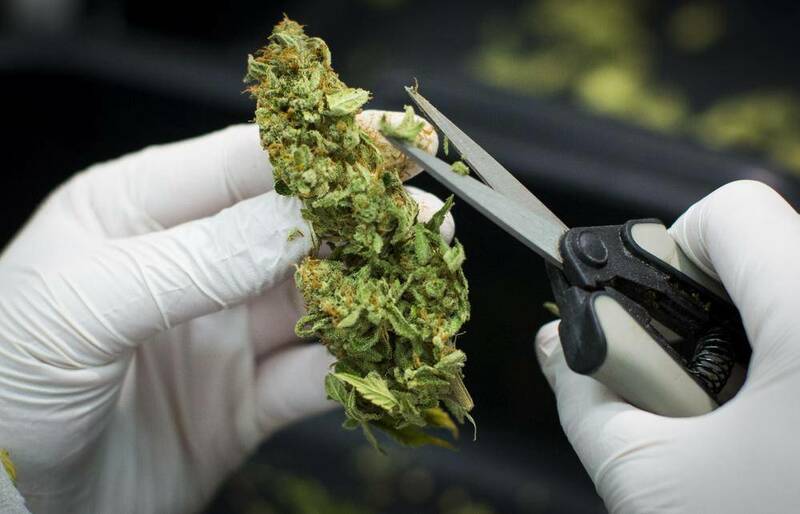 He was then introduced by a friend to SPARC Dispensaries, which needed a head cultivator for their grow operations. Jason Stirling enjoying the fruits of his labor. Jason graduated from East Tennessee State University with a degree in economics. His coursework explored black markets and prohibition marketplaces, which turned out to be quite pertinent to cannabis. What can you tell us about SPARC? Jason: I’m not allowed to disclose much information about SPARC, but I can say that they use state-of-the-art equipment and a vertically-designed nursery. The vertically-designed nursery uses LED lights to reduce energy costs and increase plant density. I find that growing hydroponically gives you a level of control and stability that can maximize yield and reduce growing times. 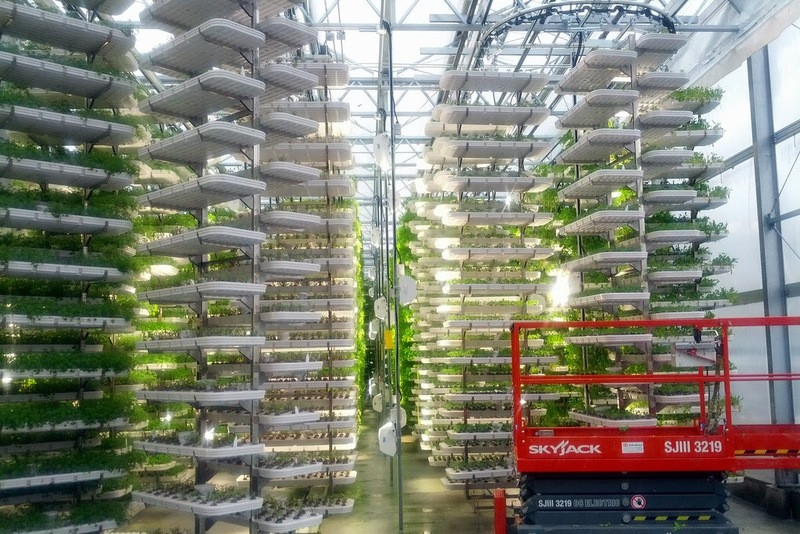 An example of a vertically-designed growing room. SPARC implements a perpetual flowering system, where the plants are flowering on a continual schedule, rather than a single large harvest. Harvests are always going on. Why did you start using teas? Jason: I originally started out using conventional nutrient solutions like Floralicious Plus, humic acid, kelp additives, and other similar products. We were trying to increase the brix level through conventional nutrients. I was reading about methods to improve plant health when I found a bunch of books about teas and how they can elevate brix levels. I figured out that brewed teas achieve the same results as the 7 or 8 supplementary nutrients I was using at the time. When I switched to teas, I saved a lot of money, because not only did the tea provide all the nutrients our plants needed, they also provided beneficial bacteria. Switching to teas resulted in our nutritional expenses dropping like a rock. 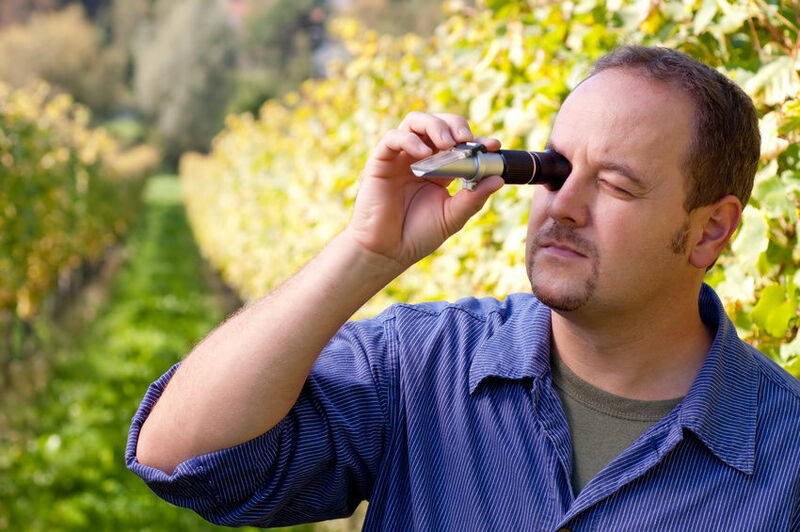 You can be just as classy as this guy using a Brix refractometer. Rudolf Steiner, the father of biodynamic agriculture, wrote many early books about the subject of teas, and he’s kind of my mentor when it comes to understanding teas and how and why they’re used. Editor’s Note: Brix, denoted as degrees Brix (°Bx) is a measurement of sugar content in an aqueous solution. One degree Brix is 1 gram of sucrose in 100 grams of a solution. Thus, Brix represents the strength of the solution as a percentage of mass. Brix does not strictly apply to sugar and can be used to measure any amount of dissolved solids in a solution. In the context of cannabis, degrees Brix can be measured in the xylem, phloem, or flower of the plant during different life stages. Higher Brix content means that more nutrients are being delivered around the plant relative to water content. Brix can be measured by comparing the density of the solution to the density of water. Steve Storch, the inventor of the Vortex Brewer®, grew up in Brooklyn, New York. Having lived near one of the largest ports in the world, Steve quickly grew familiar with freighters and some of their “illicit” cargo. 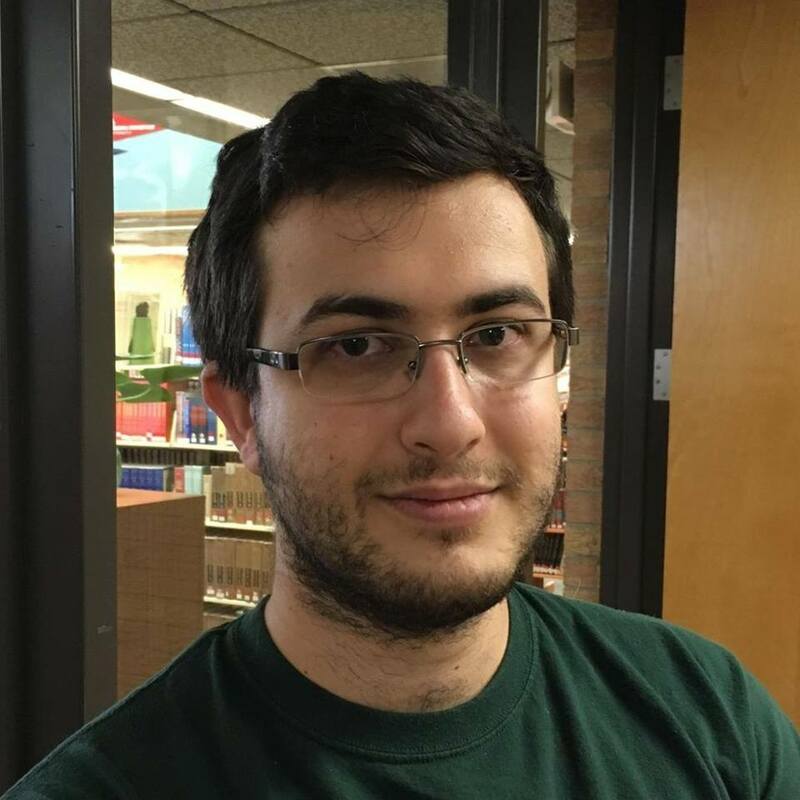 He chose to study marine biology in both high school and college and graduated from Southampton College, now part of Long Island University. 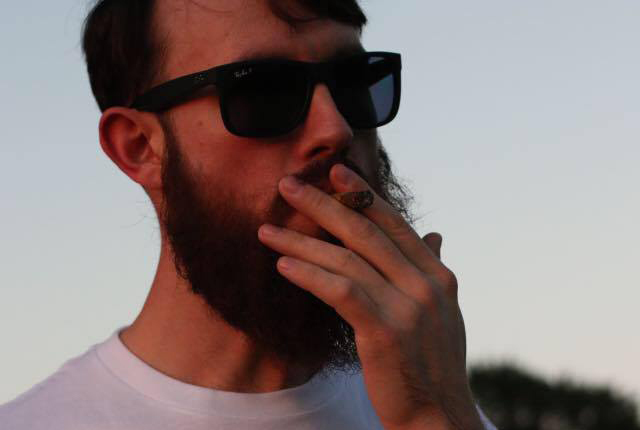 Scott McBride started growing cannabis at an early age, once he discovered its recreational uses. He grew what he calls “guerrilla gardens” in the coniferous swamps near his family’s camp in Northern Michigan. He filled barrels with hand-made soil and carried them into partially submerged portions of the swamp with ample sunlight. The cedar swamps turned out to be great spots to grow, as wildlife and humans were very unlikely to disturb the plants. He went to college on a skiing scholarship and earned his degree in international business. Nowadays, he grows above-board in compliance with the medical laws in Michigan. He also owns and operates a manufacturing and distribution facility on 4.5 acres. Steve Storch (left) and Scott McBride (right) making biodynamic preparations. The two met when Steve went to work for a company that distributed Steve’s early Vortex Brewers®, and the two eventually became friends and partners in business. Scott travels to Steve’s farm regularly every year to help Steve make BioDynamic preparations that go into Vortex Brewer® Compound and Tonic. 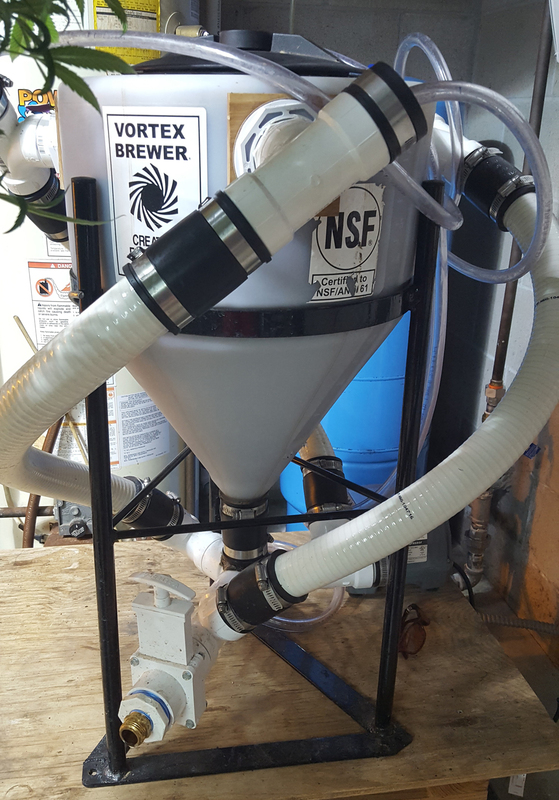 What inspired the Vortex Brewer®? Steve: I was inspired by the agricultural lectures of Rudolph Steiner, the inventor of biodynamic agriculture, and Victor Schauberger, an Austrian naturalist who was described as “The Water Wizard.” Both Steiner and Schauberger’s works described a water vortex as a “primal” force, essential to life. I used my background in marine biology to design a brewer that created a large vortex with air jets. The first brewer was built in the winter of 1998, and not long after, many local farmers were interested in buying one. Why should a grower use a tea over a conventional compost? Compost teas are going to give you trace minerals you won’t find in your basic NPK nutrients. Teas give your plants almost everything they need on the periodic table. The result for the plants is that they have more vigor and a stronger immune system. They become more tolerant of harsh conditions like drought. Extra nutrition unlocks otherwise unavailable genetic traits because the plants are less stressed. In the long run, you save money because you only have to buy the teas to meet your plants’ nutritional needs, rather than 7 or 8 different nutrient products. Anything that makes your water vortex is going to improve your air-water ratio by increasing the surface area and volumization of the water. If you use all these ingredients in a bucket with an air bubbler, you’re going to be much worse off than if you have a Tornado with a vortex running for 24 hours. Teas are typically made with compost in them, so it’s not an either-or situation. You can use can use both compost and tea in your soil mix. Compost is made up of living organisms. Every grow operation should maintain their own compost! The vortex made by the Vortex Brewer® oxygenates the water, improving electrical conductivity (EC) for your plants, making it a better nutrient transporter. The oxygenated water (with improved EC) can help colonize beneficial microbes, allowing them to grow and multiply. The beneficial microbes unlock minerals and nutrients in the compost, particularly components that might not be present in the soil. What are the drawbacks to using a compost tea? You need tea brewing on-site. That means you need the physical space to brew the tea, and if you’re in a tightly packed facility, that may not be feasible. Brewing on-site also means you need the equipment to brew. That means water tanks, power sources and an air supply. That costs money up front. But as I mentioned, it will save you money in the long run. There’s a learning curve when you learn how to make and use teas. It takes time. Sometimes you will want a compost or nutrient input that’s impractical to acquire locally. It will cost money to get it shipped to you. Brewing adds another job to the workload. It takes extra time out of each day. Take us through the steps of brewing. Brewing on a commercial scale is a daily practice. We have a brewer big enough for one 24-hour cycle. As a result, we’re constantly brewing. As soon as we drain it, we fill it right back up and renew it. Since teas include beneficial bacterias and we’re using a vortex style of brewer, we only need to clean the tank once every 6 months. It doesn’t get dirty and it doesn’t get foul. One of the smaller brewing models, good for a beginning grow. The key though, is to store your inputs at optimum temperatures. The temperature affects the vitality and speed of the brew. Your tea brewers and tea should be kept at a constant temperature, never hotter than 90 degrees Fahrenheit, with an ideal of 75 degrees Fahrenheit. And you want to make sure you don’t have any microfilters smaller than 400 microns, so you don’t inhibit the beneficial bacteria. As far as a delivery system goes, you can directly tether your brewer into an injector system or irrigation lines. You can also hand water with the tea. Once we have the concentrated tea brewed, we mix the tea with water at a 1:9 ratio. First you need to fill up the brewer with water to the amount you want. Plug it in and let it run for 20 minutes or more to oxygenate the water. After the water’s ready, we can start adding our inputs. I like to use sea minerals for silica content, equisetum tea for beneficial fungi, and some other compost to round it out. Just be careful to not put too much material in, or you could plug up the brewer, and that’s a headache. Once everything’s in and running smoothly, I’d let the brewer work for at least 20 minutes to an hour. If you want the best results, you can let it brew longer to improve microbial growth. While it’s running, you can check the plants, thin leaves, whatever you need to do. And once it’s all done, apply as you normally would. Just be careful when spraying the mixture. You want to keep your PSI below 30 PSI if possible. What you’re spraying is living tea. If you’re using 110 PSI, what comes out the other end probably won’t be alive any more. It would be a little microbe armageddon. What about cleaning the brewer? All I need is high-pressure, hot water from a pressure washer to clean the tank. You can also break down the air hoses and sanitize those with a little H2O2 (hydrogen peroxide) or a bleach salt. Just make sure to triple rinse the hoses before reinstalling them. Automated systems are constantly running and flushing in your daily operations. If you have injector systems, the manufacturing companies recommend you clean them regularly anyway, regardless of what you’re using. What brands of tea do you prefer? If you don’t have the components to make your own teas, the Progress Earth teas are great. Their philosophy to tea goes back to biodynamic agriculture, which Rudolf Steiner designed. In my opinion, they have the optimal tea recipe out there. I would be remiss if I didn’t mention our Vortex Brewer® brand of teas and BioDynamic inputs, made by Steve Storch. Our Pure Grow Soil line, made in conjunction with Kemper Burst, includes soil and balanced mixes for your grows. Pure Grow Soil sources its BioDynamic inputs from Storch and includes these ingredients in Cannabis-specific mixes for your grows. What results have you seen from using teas? The first time I used tea, I got extra hairs on my plants. The plants also had more vigor and produced more flower than normal for that strain. I saw stress resistance improve. The plants could tolerate harsher conditions. Pest management got easier as well — the amount of powdery mildew and bugs decreased. It really helped, and continues to help, with the overall health and vigor of the plant. I also saw higher cannabinoid levels, which is directly tied to brix levels. Anything you can do to increase your brix level can increase your cannabinoids. Tea is great for brix, especially if you weren’t using tea at all before. …they saw plants nurtured back to health, seemingly from the dead. We usually get phone calls from people who have visited a friend’s grow operation and were blown away by their results. Many of our customers have shared similar experiences where they saw plants nurtured back to health, seemingly from the dead. Is there a difference between using teas in hydro and in soil? We’ve had repeat customers for both hydro and soil. They rant and rave about increased flavor, terpenes, and more. When you make teas in hydro, you’re essentially attempting to recreate healthy lake water. Your reservoir and your pipes are like the rivers and tributaries feeding into the lake. The brewer renews the water by adding supplies of nutrients and beneficial microbes. I would like to see the philosophy of biodynamic agriculture and compost teas become more common. I feel that teas are really beneficial and can be done with locally-sourced ingredients. It would be great if there were more vendors spread across the marketplace, so that teas could use local ingredients. It’s more environmentally and fiscally sound. For example, Progress Earth is located in North Carolina. I’m almost literally paying to ship cow poop from North Carolina to San Francisco, because Progress Earth understands the proper mix. 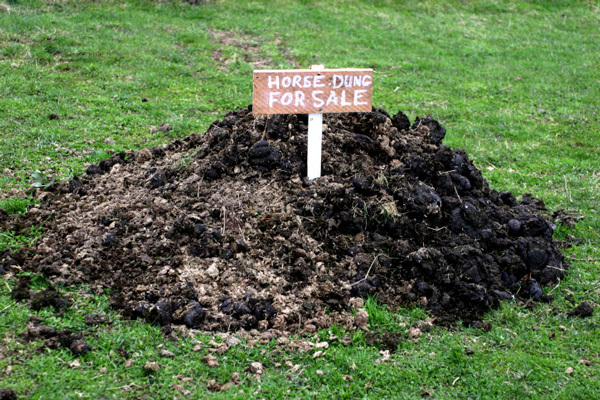 If more companies popped up in every state and used local cow poop, then we would reduce the number of cars on the road. Shipping this is not good for the environment. Whether you’re using the brewer or not, I think it’s a great opportunity to put more intent into what you’re growing. If you want quality out of your product, take the time to think about what you’re doing and plan it out. It’s important that we’re creating cannabis that has the best attributes we can give it — the best nutrient content, the best flavor, and the best value. But what’s even more important is that the soil or water we use returns to the environment better than what we started with. Compost teas let you use less product and deliver better nutrition to your plants without harming the ecosystem. 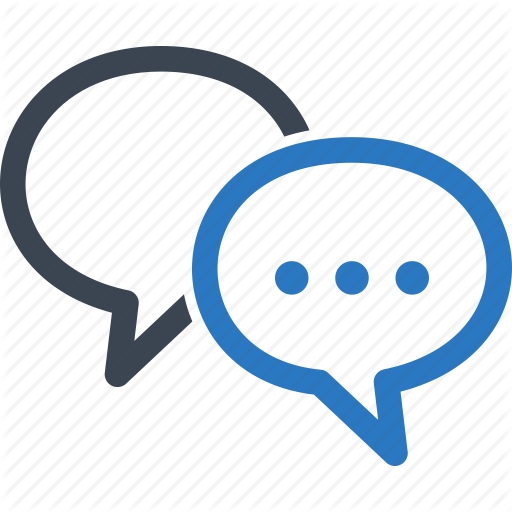 Want to get in touch with Jason Stirling, Scott McBride, or Steve Storch? Jason Stirling is a lead grower for SPARC, San Francisco. You can also find him via his LinkedIn or Facebook accounts. Scott McBride can be reached via his email here or contacted via the Vortex Brewers® contact form. Steve Storch can be reached through Scott McBride. A group of different studies on biodynamic agriculture can be found here, here, and here. Interested in purchasing your own Vortex Brewer®? Head on over to their website to order one.